Cen Chen | New | Recruit | CHUGAI PHARMACEUTICAL CO., LTD.
I’m in charge of clinical research of lung cancer drugs. There are various jobs in the field, such as clinicopathology and statistical analysis, but I specialize in Study Management —a job that requires communicating with people outside the company. My main job is to apply drug candidates that are brought in from research labs to patients, and collect data to verify the drug’s efficacy and safety. When there are inquiries or demands from various facilities—hospitals in particular—I find the best solution through various discussion with people from different departments to deal with the matter. A lot of these requests require speedy answer and there are times when patients may be waiting, so I gather meetings as quickly as possible in order to respond. Sometimes it takes a whole day to respond to only one request. Other than that, I write various documents related to updating of clinical research information. I also attend telephone conferences to communicate with overseas staff of partner companies or members of the Global Study Management Team. When we establish a new clinical trial, members of the Global Study Team of Roche and Genentech fly in to Japan to attend a clinical conference held for investigators and clinical trial coordinators. As a student, I studied Life Science, but I had never been involved in medicine or disease. The medical field was very new to me, so the learning process has been on the job, ever since I joined Chugai two years ago. The doctors who cooperate in the clinical trials are all experts with extensive experience in the field. Communicating with them, enables me to acquire new knowledge and information, but diligence in advance is essential in order to exchange rich conversation with them. From the beginning, I had a strong urge to find a job that helps people. Being in a pharmaceutical company, the best moment is when I am informed by a doctor that a patient told him that the drug we tested actually worked. During the first six months at Chugai, I remember I took part in a work for on site monitoring. One of the patients I monitored had cancer and he had to repeatedly enter and leave hospital as his cancer advanced. But after participating in one of our clinical trials he showed signs of recovery. I was deeply moved when I am informed by the doctor that the patient was happy that he was able to go on an overseas trip again. 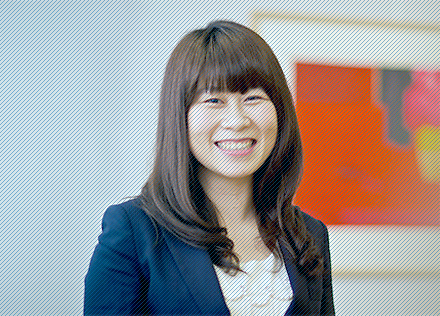 My future dream at Chugai hasn’t changed ever since I joined the company—I want to create an environment in which Japanese drugs are used more widely around the world, including China, my home country. Unfortunately, for various reasons, drugs approved by advanced countries have yet to reach patients of developing countries. From quite a long time ago, Japanese drugs—typically antibody preparations—for me, have the image to be not only excellent in medicinal efficacy, but also very safe to use. I hope in the future, I can spread technically advanced Japanese drugs to people in China and other countries, with small amount of delay. In that sense, Chugai matches me perfectly. To begin with, in times when development of low-molecure-weight drugs is mainstream Chugai challenges to explore the new, unknown field of biomedicine. In addition, a lot of courage is required to cultivate new grounds with its strategic alliance with a foreign firm—Roche—so that it can broaden its field of research. These I think show Chugai’s endeavor for challenge, which really appealed to me. I find Chugai to be a company that can provide me with an opportunity to work globally, with which I will be able to make the most of my experience of studying overseas. Working at Chugai for two years, I find it to be a workplace where you are given large-scale, responsible work even if you’re an international staff or a freshman. To be honest, I had the impression that Japanese companies only let newcomers serve tea or make copies, but no! Not at Chugai! We’re all treated as respectable individuals, and that kind of workplace environment allows me to devote myself to work. Also, Chugai has been promoting diversity these few years, and there have been some dramatic changes. But in order to adapt to globalization, I think it needs to take further procedures. A more diverse range of international staff of various cultures needs to come in to achieve diversity that excels gender differences. The goal is to create an atmosphere in which people of various cultures, customs and ideas, can knock their ideas against each other with respect and tolerance, while expressing their own ideas. It’s something I’m really heading towards, so please, people who want to challenge globally come and work with us at Chugai! We’ll be waiting! Influenced by my uncle, who studied in Japan, I have always had an interest and an admiration toward Japan. When he brought home Japanese nail clippers that had little pockets that collect cut nails, I was fascinated with Japanese craftsmanship for making heart-felt items of delicate, efficient design. I decided to come to Japan when I reached 18. 2004 10　Come to Japan. Learn Japanese at a language school in Kyoto, while studying for entrance exams to enter Japanese universities. 2006 4　Enter Nagoya Institute of Technology, Department of Life and Materials Engineering. 2010 3　Graduate Nagoya Institute of Technology, Department of Life and Materials Engineering. 2010 4　Enter Nagoya University, Graduate School of Bioagricultural Sciences, specializing in Molecular and Cellular Regulation. 2012 3　Graduate Nagoya University, Graduate School of Bioagricultural Sciences, specializing in Molecular and Cellular Regulation. 2012 4　Enter Chugai Pharmaceutical as a new graduate.